Am Samstag, den 11.11.2017, eröffnete das erste Museum, welches außerhalb Frankreichs den Namen „Louvre“ tragen darf. Und es ist das erste Museum in der arabischen Welt, welches in solcher Ausführlichkeit und Menge Kunst und Kultur der westlichen Welt zeigt. Einzig die Darstellung des nackten Menschen musste draußen bleiben – aus verständlichen Gründen. Trotzdem muss dieses Experiment aus vielerlei Gründen für geradezu revolutionär angesehen werden. Beginnen wir mit der Architektur, die für sich allein schon spektakulär ist. Jean Nouvel, Pritzker-Preisträger seit 2008, ist durch seinen Bau „L’Institut du Monde Arabe“ in Paris im Jahre 1987 weltweit bekannt geworden. Was lag also näher als ihm den Auftrag für das erste große Museum in den Emiraten zu geben. Er orientierte sich dabei an den klimatischen Verhältnisse der Gegend und an der traditionellen Bauweise der Araber. Um die starke Sonnenstrahlung abzuhalten konstruierte er ein Kuppeldach, welches mit einer leichten Wölbung 180 Meter im Durchmesser misst und aus zwei Schichten sternenförmig angeordneter Metallträgern besteht. Sie streuen das durchfallende Licht „wie die Blätter einer Palme“ (Jean Nouvel). So gibt es überall gleichmäßig natürliches Licht, ohne dass es als unangenehm empfunden wird. Unter der Kuppel befinden sich wie in einem alten arabischen Dorf 26 Häuschen in kubischer Form. Darin befindet sich die permanente Ausstellung. Das Museum befindet sich im Stadtteil Saadiyat, welcher als vorgelagerte Insel in Zukunft noch weitere spektakuläre Gebäude beherbergen soll. So sind ein Nationalmuseum (Architekt Sir Norman Foster), ein Guggenheim Museum (Frank O. Gehry) und ein Konzerthaus (Zaha Hadid †2016) geplant. 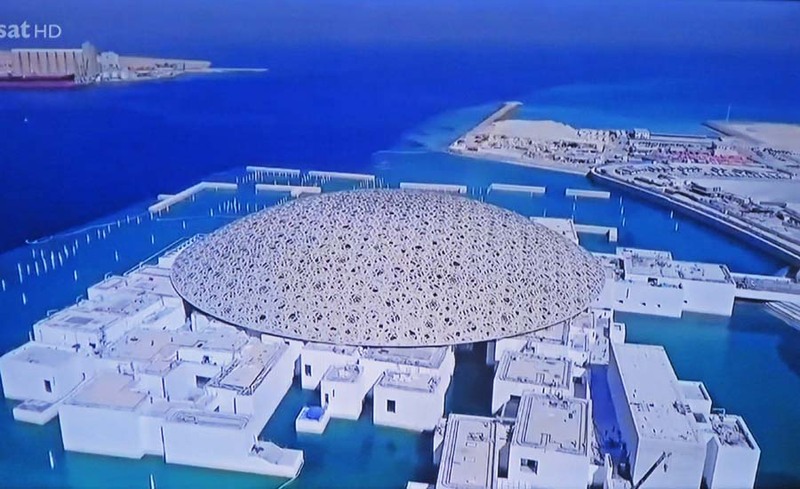 Das Museum Louvre Abu Dhabi hat unterhalb seiner Kuppel eine Ausstellungsfläche von 8.000 qm, wobei die permanente Ausstellung davon 6.500 qm einnimmt. Diese permanente Ausstellung, genannt „See Humanity in a new light“, ist in zwölf Abteilungen (12 Galerien) aufgeteilt und soll die gesamte Menschheitsgeschichte darstellen. Wobei immer der politische Hintergrund mit der Kunst- und Kulturgeschichte der jeweiligen Epoche zusammengefasst werden. Spuren von menschlichem Leben auf der Arabischen Halbinsel am Persischen Golf reichen bis 100.000 Jahre vor Jesus Christus zurück. Erste Reliquien stammen aus 8.000 Jahre v.Ch. Besonders interessant wird es politisch, wenn der Ausstellungsrundgang in die Neuzeit kommt. Wir wir alle wissen verlor das Arabische Volk, nachdem es im 15. Jahrhundert vollständig aus Spanien vertrieben worden war, an Glanz und Einfluss in der Welt. Die Blüte ihrer Kultur, die im Mittelalter in den Bereichen der Geistes-und Naturwissenschaften der westlichen Welt weit überlegen war, hatte ihr plötzliches Ende gefunden. Auch die neuen demokratischen, freiheitlichen Strukturen, die wir uns in Europa dank der französischen Aufklärung und ihrer anschließenden politischen Revolution erschaffen konnten, ist den Arabern bis heute völlig fremd geblieben. Wie aber soll man diese Niederlage in einem eigenen Museum darstellen? Ich denke, sie haben es ganz geschickt angestellt, so dass sie selbst dabei ihr Gesicht wahren konnten. Gallery 9: A New Art of Living …Across all continents, the arts reflected an increased emphasis on the private sphere, the individual and the family. With the growth in global exchanges, the arts developed an imaginative image of remote lands and cultures. Europe was increasingly pervaded by a philosophy of progress and reason referred to as the Enlightenment. This intellectual movement focused on the individual and their role in history, as illustrated by the American and French revolutions at the end of the century. Neben all dem Terror des radikalen Islam gibt es eine große Gruppe von Menschen in der arabischen Welt, die sich mit der westlichen Welt aussöhnen, ja sogar annähern, möchte. Und womit ginge dies besser als mit Hilfe der Kunst. The first museum of European art in the Arab world. On Saturday, 11.11.2017, opened the first museum, which may carry the name „Louvre“ outside of France. And it is the first museum in the Arab world that shows the art and culture of the western world in such detail and quantity. Only the representation of the naked person had to stay outside – for understandable reasons. Nevertheless, this experiment must be considered revolutionary for a variety of reasons. Let’s start with the architecture, which by itself is spectacular. Jean Nouvel, winner of the Pritzker Prize in 2008, became known around the world in 1987 for his construction „L’Institut du Monde Arabe“ in Paris. So what could be better than giving him the order for the first large museum in the Emirates. He oriented himself to the climatic conditions of the area and the traditional architecture of the Arabs. In order to prevent the strong solar radiation, he constructed a dome roof, which measures 180 meters in diameter and consists of two layers of star-shaped metal girders. They scatter the passing light „like the leaves of a palm tree“ (Jean Nouvel). Thus, there is uniformly natural light everywhere, without it being perceived as unpleasant. Underneath the dome there are 26 cube-shaped houses, as in an old Arab village. This is the permanent exhibition. The museum is located in the district Saadiyat, which as an offshore island which will house in future even more spectacular buildings. For example, a National Museum (architect Sir Norman Foster), a Guggenheim Museum (Frank O. Gehry) and a concert hall (Zaha Hadid † 2016) are planned. 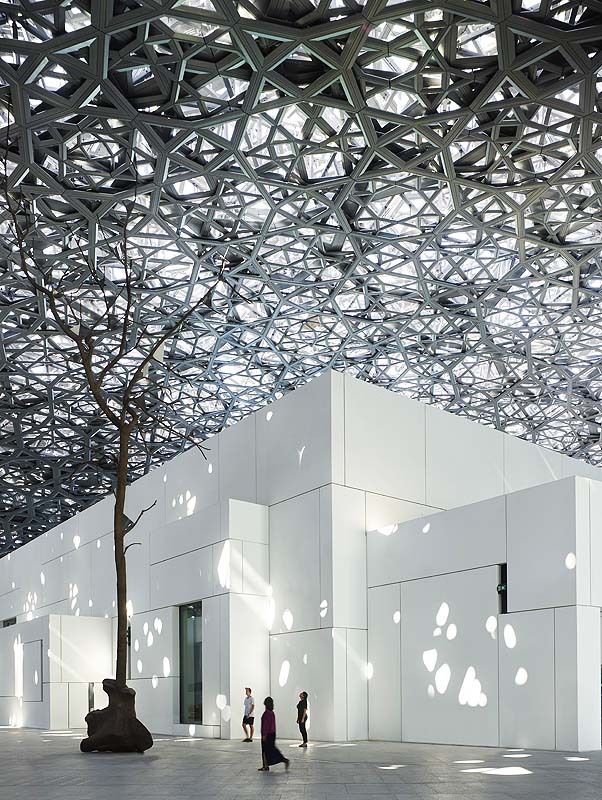 The Louvre Abu Dhabi Museum has an exhibition area of ​​8,000 square meters below its dome, with the permanent exhibition covering 6,500 square meters. Politically it will be particularly interesting if the exhibition tour comes into modern times. We all know that the Arabs, after being completely expelled from Spain in the 15th century, lost their splendor and influence in the world. The flowering of its culture, which in the Middle Ages was far superior in the fields of the intellectual and natural sciences of the Western world, had come to an abrupt end. The new democratic, liberal structures that we were able to create in Europe thanks to the French Enlightenment and its subsequent political revolution have remained completely alien to the Arabs to this day. But how is one to portray this defeat in a museum of its own? I think they did it very skillfully so that they could keep their faces. Gallery 9: A New Art of Living … Across all continents, the arts reflected in an increased emphasis on the private sphere, the individual and the family. With the growth in global exchanges, the arts developed in an imaginary image of remote lands and cultures. Europe was increasingly pervaded by a philosophy of progress and reason to the enlightenment. This intellectual movement focuses on the individual and their role in history, as illustrated by the American and French revolutions at the end of the century. In addition to all the terror of radical Islam, there is a large group of people in the Arab world who want to reconcile with, or even approximate, to the Western World. I am convinced of that. And how would this work better than with the help of art?